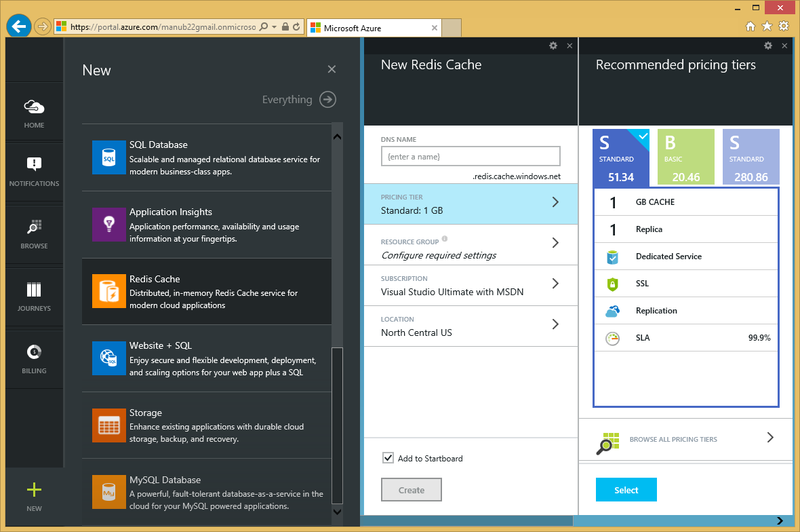 Microsoft today announced the general availability of Azure Redis Cache, as well as its related pricing changes. Azure Cache is a family of distributed, in-memory, scalable solutions that enables you to build highly scalable and responsive applications by providing you super-fast access to your data. It’s based on the popular open source Redis Cache, and it gives you access to a secured, dedicated Redis cache that’s managed by Microsoft. 1. Azure Redis Cache: Built on the open source Redis cache. This is a dedicated service, currently in General Availability. 2. Managed Cache Service: Built on App Fabric Cache. This is a dedicated service, currently in General Availability. 3. In-Role Cache: Built on App Fabric Cache. This is a self-hosted cache, available via the Azure SDK. 1. High performance: Azure Redis Cache helps your application become more responsive, even as user load increases, and leverages the low-latency, high-throughput capabilities of the Redis engine. This separate distributed cache layer allows your data tier to scale independently for more efficient use of compute resources in your application layer. 2. Great features: Redis is an advanced key-value store, where keys can contain data structures. It supports a set of atomic operations on these data types, and it supports master/subordinate replication, with fast non-blocking first synchronization, auto-reconnection on net split, and more. Other features include transactions, Pub/Sub, Lua scripting, and keys with a limited time to live. 3. Easy to use and manage: Provision Redis cache using the Azure Management Portal. You can use Redis from most programming languages used today. Easily manage and monitor health and performance in the Azure Preview portal. Let Microsoft manage replication of the cache for increased availability. 4. Azure Managed Cache Service: Azure Managed Cache Service is based on the App Fabric Cache engine. It also gives you access to a secure, dedicated cache that is managed by Microsoft. A cache created using the Cache Service is also accessible from applications within Azure running on Azure Websites, Web & Worker Roles and Virtual Machines. 5. In-Role Cache: In-Role Cache is based on the App Fabric Cache engine. In-Role Cache allows you to perform caching by using a dedicated web or worker role instance in an application deployed to Microsoft Azure Cloud Services. This provides flexibility in terms of deployment options and size but you manage the cache yourself. 1. Basic: A Single Cache node. Multiple sizes. Ideal for Development/Test and non-critical workloads. 2. Standard: A replicated cache in a Two-node Primary/Secondary Configuration. Includes SLA and replication support. Multiple Sizes. Cache is available in sizes from 250MB upto 53GB. –> For more info on “Azure Caching” check my friend’s blog, [link] – Author: Ganesh Shankaran.